It happens to everyone. Whether it’s a big essay, art project, or budget report, there’s work to do and we’ve got to get it done. We get our cup of coffee ready (ALWAYS Step #1), review our notes and brainstorms if we have any, complete any other prerequisite procrastination rituals, and sit down ready to make magic happen. Buzzing with anticipation, we reach into our mind expecting it to pop like a water balloon filled with pure brilliance. But no pop comes. Our ocean of ideas is drier than the Sahara. Perhaps we’re not quite as prophetic as we thought. Even after coffees #2 and #3, still nothing. Our optimism fades to anxiety or worse. Whether you’re a stockbroker, journalist, artist, or student, the blank canvas can be one of the most intimidating things to face. And we face it all the time. Sometimes thoughts flow seamlessly from mind to canvas, but more often than not we hit a road block along the way. The best way to stimulate a difficult task or stagnant project is to ask for a fresh perspective. We all come from different social, cultural, and economical backgrounds and, as a result, we all see the world a little differently. As a result, we also solve problems differently. My oldest friend and I have known each other since kindergarten and we’ve always worked well on projects together. We attended the same schools together all the way through community college, but even after I went on to UCSD, I still would occasionally call him for help. Our ideas were usually different, but they often complemented each other. In my opinion, this is the greatest strength of the Creative Community Council. 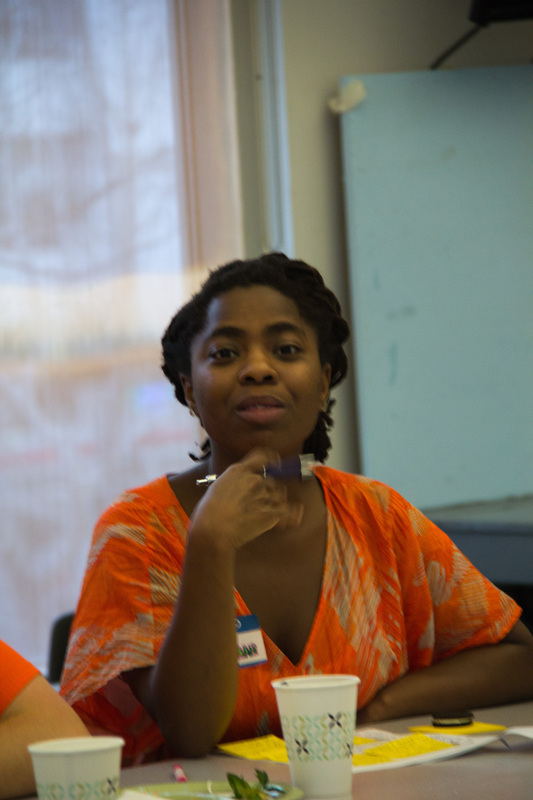 The CCC is a group of individuals from a wide variety of backgrounds working together to bring The Children’s Creativity Museum and its education philosophy to communities in the Bay Area that wouldn’t otherwise have access. The Council realizes that if the goal is to outreach to different communities, than representatives of those communities absolutely must be involved from the beginning. It also realizes that the C.I.T.Y. Teens have an important first-hand role in facilitating the museum’s exhibits during its busiest days. Who better than them to inform us on what the museum is actually like on the floor? 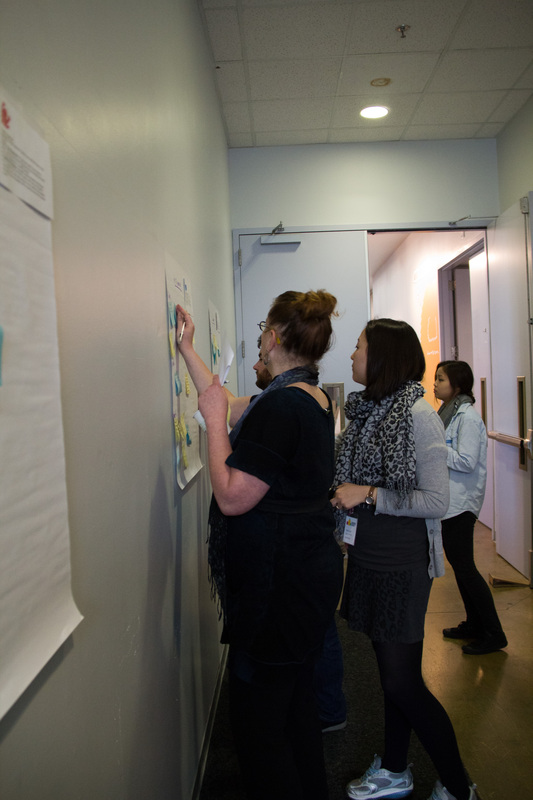 Instead of a committee of uninvolved people hypothesizing about what the museum needs or what the target community needs, the CCC comprises itself of members who are directly involved with the museum and these communities on a day-to-day basis. They take this wealth of experience and direct it towards the different speed bumps that the museum faces in outreaching to and engaging with different communities. This task would be far too great for one person, no matter how talented. Luckily, the Council is many talented individuals working together. During the Council’s afternoon meetings, members constantly bounce ideas back and forth. The emphasis is always on discussion, never monologues or presentations. When the Council finds solutions that they’re happy with, they present those ideas to the rest of the museum staff for even more feedback. Everyone’s ideas are equally listened to, which makes participating in the council as inspiring as it is refreshing. When you’re surrounded by something everyday, bigger social implications and even clever metaphors can sneak their way into your brain. That being said, we see a lot of Angry Birds here at the museum. Now, I can’t say I’m the biggest fan of Angry Birds. Yes, I have the app on my phone and occasionally play it, but the craze surrounding the game is a bit lost on me. For whatever reason, kids are absolutely obsessed with this game and have helped drive it to become the best selling app of all time. The Birds are also one of the most popular characters to make in our Animation Studio. One of the most entertaining parts of playing Angry Birds is getting to use the different kinds of birds. One bird is a straight shooter, one drops an egg bomb, one flies like a boomerang, etc. We learn how to use these birds individually level by level, but without a doubt the best levels in the entire game are the ones where we get all the birds. We get all the cool moves and powers at our disposal, but we have to think strategically about how and when to use them. 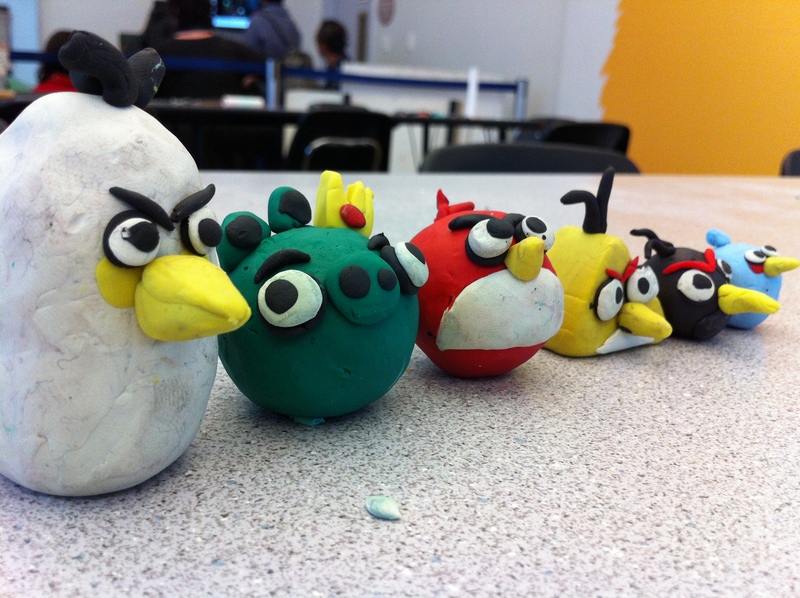 After taking the above picture of a visitor’s clay rendition of the entire Angry Birds cast, it struck me. The CCC are the museum’s cast of Angry Birds. The Council isn’t a single trick up the museum’s sleeve, it’s a whole collection of tricks and powers, experiences and backgrounds. Just as we break down the pig’s obstacles and strategically assign our birds to take it down, the Council helps to identify the museum’s outreach needs and assigns the best combinations of members to create solutions. The Council broke down the museum’s core group of visitors into different age brackets, and collaboratively conceptualized different strategies that would be best tailored for each group. The potency and variety of proposed community engagement strategies that the Council created speaks to the special blend of people working together towards a common goal. We all may wish we were all-in-one super heroes, autonomous entities that can solve business and creative problems without ever needing assistance. However, the sooner we all realize that we’re not “The Mighty Eagle” bird and call the rest of the gang for help, the better off we’ll be. This entry was posted in Educational Philosophy, Intern Program, Programs. Bookmark the permalink.